Hardwood floors are what you need for your house and always needed! Of course, this is a coveted item for any new home. This is the first renovation you should invest your money in. The rich, warm, earthy tones of ash, cherry or maple hardwood are pleasing to the eye and give a room a classic aesthetic. Hardwood floors make every room stylish and atmospheric. But there’s some debate about the best way to clean them. 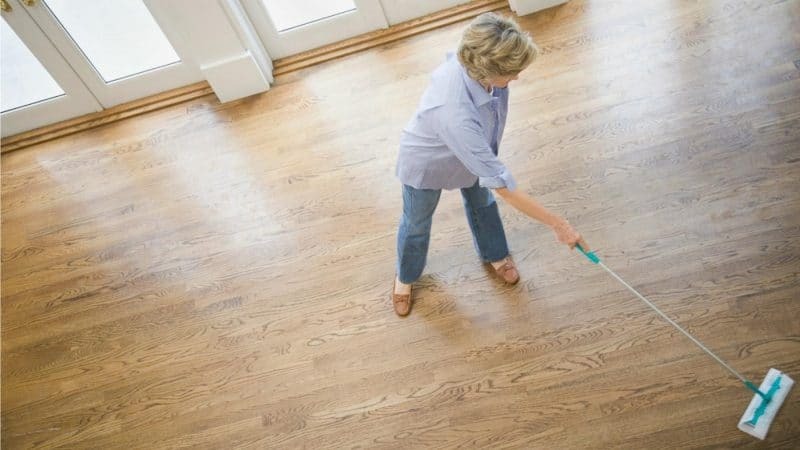 Cleaning hardwood floors is a weekly task to ensure your investment is still a beautiful part of your living space. You should read the information below and find all possible easy ways to clean hardwood floors. Forget about your headache! Here is a brief guide on how to clean hardwood floors in three easy steps. But before cleaning, you should investigate and learn some information about your flooring. Before you grab a bucket of water and a mop, it’s best to find out how your hardwood floor is sealed. Are you surprised? Don’t be! The finish, not the wood type, will determine how you clean and care for the floor. Surface-sealed floors: Most new wood floors are sealed with urethane, polyurethane or polyacrylic. Surface-sealed floors are stain- and water-damage resistant and easiest to clean: just sweep, mop and you’re done! Not sure what kind of finish you have? If you want to know the truth, just rub carefully your finger across the floor. If there are no smudges, the floor is surface sealed. If you do create a smudge, the floor has been treated with a penetrating seal, oil finish, shellac, varnish or lacquer. If you still believe that taking your shoes off as soon as you come in the door, you save your floor from the tracked-in dirt that can wreak havoc on a wood floor’s finish, you are right. Dirt and grit are abrasive and over time these particles leave behind fine scratches that make your floors look dull. Goof vacuum cleaner helps you to remove dirt and fine debris from the cracks and crevices of a wood floor. This is the easiest from all easy ways to clean hardwood floors. Vacuuming with its long brush, you can get all the smallest dirt out. Don’t let spills and spots dry on the floor. Blot spills immediately with an absorbent cloth. The worst thing you can do is let water puddle on the floor. Follow up with a damp paper towel to remove any residue and buff dry. It is also important to understand what type of hardwood floors you own because polyurethane floors are capable of taking water, so mopping technique is appropriate. If your floors are lacquered or shellacked, don’t use water, water can stain the wood and cause buckling. Step one: clear your hardwood floor of furniture. If you have much larger furniture then you may need to just need to stick to the ones that are easy to move. Your family or friends can help you with the process. Group efforts make things better. Once you have cleared the floor of all visible furniture, you can proceed to step two. Step two: vacuum the floor to clean all the surface debris from your hardwood floors. This helps take away what is visible to the eye like dirt, lint, dust, and fallen scraps. Step three: get a mop and a bucket of water mixed with some liquid dish soap. Before you start mopping, make sure you ring the mop thoroughly before you use it on the floor. Proceed to mop the floors clean until satisfied. Speed up the cleaning process by dusting the floor with a mop that has been treated with a dusting agent (or use a microfiber dusting pad with fringe) to pick up dust, dirt, and pet hair that might scratch the floor’s surface. For routine cleaning (at least once a week) use a vacuum with a floor-brush attachment or opt for an electric broom. It’s not difficult to go to the nearest grocery and buy disposable electrostatic cloths for immediate dusting. You can use both sides of the electrostatic cloth when used for dusting. Do a full sweep with a Swiffer – special mop for dry cleaning. Start at one corner of the room and move your way down, and side to side. This is the way to clean your room of all visible dirt and debris. Next take out some commercial wood floor cleaning sprays. These can be found at your local grocery store or hardware store also. Spray down the floor with the cleaner and use a flat mop to mop as you spray. It is important to note that if you are used to using your own formula, be aware that vinegar and hardwood floors do not mix well. You can damage your floor easily! If cleaning hardwood floors still feels like it is outside of your comfort zone, or you simply don’t have time to put in the necessary care and maintenance with your busy lifestyle, don’t hesitate to contact an expert. The experts at your location have years of experience to help to make your hardwood floor look and feel brand new. Don’t hesitate to contact them and provide cleaning weekly, following the easy ways to clean the hardwood floors given above.